You're not in a position to take on a full-time pet but you know in your heart that a pet would be good for the kids. You know that many studies have shown that children who have been brought up in a home that has a pet grow up to be more caring individuals, with more empathy toward other people and what is happening in their world. You've also read that caring for a pet can teach a child how to be more responsible. Despite all this you just can't commit to a long-term pet at this time or perhaps to the expense of one. Well, don't fret, there are ways of having a pet without actually owning one, by offering short term dog boarding for dogs whose owners are on holiday. You can become a "Don't Fret Pet!" 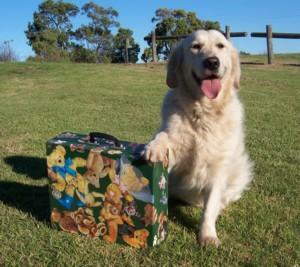 minder and mind dogs for owners who are going away. You decide on the size and breed of the dogs that you want to mind and how often you want to mind. You can take a break at any time so you aren't tied down. The dog brings along its own food and accessories so you only need to provide a secure environment and lots of TLC. The dog's average stay is 7-10 days. This is also a great way to experience different breeds of dogs if you are thinking of getting one in the future. You do need to have had dogs of your own in the past and be willing to allow the dog inside with you so that it is part of the family. You are rewarded with a wagging tail and a small daily allowance which makes great pocket money for the kids and is a part-time job that they can do in the safety of their own home. Both Assistance Dogs Australia and Guide Dogs use puppy raisers to care for pups from about the age of 8 weeks to 14 or 18 months. These dogs are then trained to assist physically disabled or sight impaired people in the community. Puppy Raisers are responsible for feeding, grooming and exercising the dogs daily, along with basic obedience, house-training, and visits to the vet when needed. You also need to socialise the pup and provide it with plenty of fun and games. You may be required to attend some training sessions on basic obedience. Sponsor a guide dog in training. For $10-30 per month, depending on which state you live in, you can watch them grow from cuddly puppies into responsible Guide Dogs with regular updates on their progress and without the responsibility of having a dog in your home. For $2 a day you can sponsor an assistance dog to be trained to assist people with physical disabilities. All vet bills and extra expenses are usually paid for by the rescue groups but you would usually need to provide food and assist with the rehoming by meeting with potential new owners. This could be difficult for the kids to see dogs coming and going but it could also give them a genuine feeling of helping an animal that may have otherwise been euthanased. A foster carer looks after a cat from the time it is rescued from a pound until it is adopted. This can be from one to two months, less for kittens. You help in rehoming the cat, putting signs up and interviewing prospective owners. You can volunteer to care for injured, sick or orphaned wildlife. You would need to attend training workshops and there is a small charge for this. You usually have to pay a small joining fee as well. The majority of wildlife needing care is birds but some mammals require care as well.